Will this variagated ivy damage our walnut tree if allowed to grow much bigger? Its about half way up the trunk between the ground and the lower branches. It looks very nice and has added interest to this area. We usually sit here in summer. Added to GoYpedia Climbing Plants. It will be fine if you trim the ivy down to the ground every time it gets a bit too high, it will soon sprout again and repeat the look. I dont think it will do the tree any harm, and you can grab handfulls and pull it off very easily if it looks as if it taking over. That looks like one of the miniature varieties ('Gold Child'?) so it will probably take a while to become threatening, anyway. im definatly agreeing with bamboo as it goes . im having trouble killing mine and if cut all the ground level roots of the ivy . it doesnt seam to spread so easily in pots i dont think as long as you make sure ya keep it trimmed without fail . I was just reading to-day in the caravan club magazine, David Bellamy saying things like ivy create an invaluble habitat and food for birds and wildlife, he was encouraging people to grow it. its great for wildlife hence keeping it on my house so long but its becomming a problem . i get anything from wrens ,blackbirds and pidgeons nesting in mine . I've got to admit, I would consider the walnuts and the tree they grew on to be much more valuable than Ivy....Unless there is an extreme lack of evergreen winter cover in the area. Ivy uses trees for support but does not feed on the tree. Generally healthy trees will not allow ivy to become fully established. However, as trees age their crowns may begin to allow more light to penetrate. In such situations the extra light can stimulate growth in the ivy at the expense of the tree which subsequently declines. Ivy tends to establish itself in deciduous trees. These trees lose their leaves in winter, to lower their wind resistance. Because ivy is evergreen, it raises the wind resistance and increases its weight which means that the tree is more likely to suffer damage in stormy conditions. 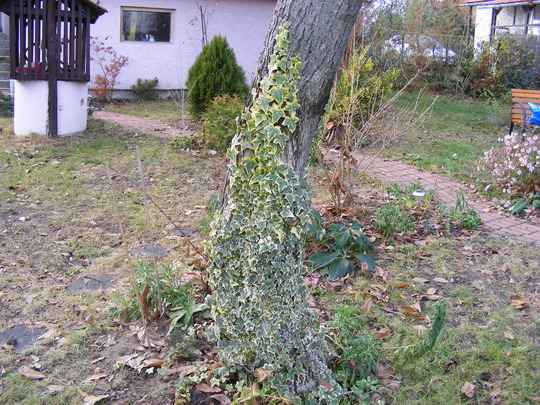 In addition, the presence of ivy can hinder tree inspections and may conceal serious defects in a tree. To remove ivy from the tree you will need to cut away a section about an inch in length further down to isolate the growth towards the top of the tree. This will then die back and fall away or can be pulled from the tree. Thanks for all your comments. Very helpful. I think this is not the fastest growing type of ivy. I will keep it in check each year so that it does not grow much higher than it is now. your welcome chrispook thats a perfect idea as it does look nice there x .